Sum 41 are a Canadian rock band that found a lot of success in the early 2000’s when mainstream music turned to pop punk for radio hits. Their first full-length album, All Killer, No Filler spawned a few successful singles, including “In Too Deep”. 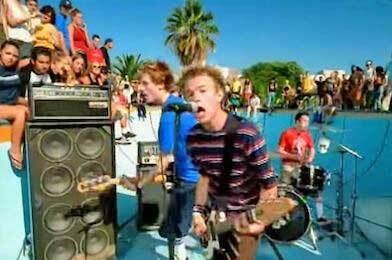 The song and its accompanying music video offer fond memories for those that grew up in this era of feel good, rebel-inspiring pop punk music. Drummer Steve Jocz wearing black and white chucks. The song is about a boy who falls in love with a girl, but encounters some rough patches along the way. He realizes that he loves her too much and he’s in this relationship too deep. He has to do everything he can to “stay afloat” and stay with her. This song, like most from the pop punk era of the early 2000’s, features lead guitar, rhythm guitar, drums, and electric bass. The song has a very feel good and fun vibe, and doesn’t take itself or its subject matter too seriously. Poolside concerts tend to be pretty common, but concerts in a pool are a new twist. 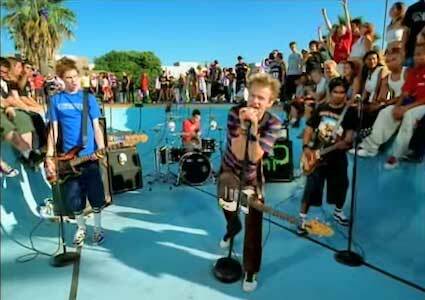 In the music video, the band enters a diving contest against a team of what seem to be all-star jocks. They’re complete opposites and at first it seems like the band is in too deep (an apropos metaphor for the song’s lyrics). However, with their charm, humor, and a bit of help from their fans, they pull out a win in the end. These scenes are intercut with the band playing a concert in an empty pool with their fans surrounding them on the edge. There are several people in the crowd wearing chucks in the pool scenes, and drummer Steve Jocz can be seen entering the diving competition wearing a black and white pair. He is also wearing them while playing the drums at the in-pool concert. The video is humorous and in good fun and takes the song’s message to a new level. Steve Jocz playing the drums in black and white chucks.